Shouting supporters attend Tsai Ing-wen’s election victory speech, at the Democratic Progressive Party headquarters in Taipei, Taiwan, January 16, 2016. One of Beijing’s least favorite people is Taiwan’s President Tsai Ing-wen, who won a landslide election victory 18 months ago on a platform calling for more separation from China—a coded way of rejecting one of the mainland’s most sacred principles: that there is but one China, and Taiwan is a part of it. And so, since Tsai’s May 2016 inauguration, Beijing has found ways to show its displeasure towards her and her Democratic Progressive Party (DPP). Most gallingly for many Taiwanese was the March arrest in Zhuhai, a city just across the border from semi-autonomous Macau, of Taiwanese human rights activist Lee Ming-che for the crime of “subverting state power.” Lee went on trial on September 11, and confessed that he “maliciously attacked and defamed the Chinese government,” a gesture that Lee’s wife said was coerced. Moreover, the mainland press has been quoting officials calling for a precise timetable for reunification. It has suspended the regular meetings between the semi-official agencies authorized by the two governments to conduct their relations. It has pressed other countries and international organizations to further isolate Taiwan diplomatically, even as its controlled press keeps reminding this self-governing island of 30 million people the grave consequences if it insists on going its own way. But is China’s policy of pressure, threat, and occasional cajolery working? Or is its often heavy-handed effort to punish Taiwan for electing Tsai driving Taiwanese away from Beijing? Much of the recent cross-straits maneuvering involves what might seem like an almost semantic point: a demand for a simple gesture regarding an unwritten deal struck 25 years ago. Beijing insists Tsai must endorse the 1992 Consensus: an intentionally vague formula struck in early negotiations between the two sides that opened the way to the multifarious ties and exchanges they have now. By it, each side agreed there is “one China,” but they also agreed each side has a different interpretation of what that means. Tsai has refused to affirm the 1992 consensus, an act of recalcitrance that has led to the steps taken by Beijing to punish her. At the same time, Tsai has gone to considerable lengths to moderate the impulses of many in the DPP to be more assertive toward the mainland. Instead, while she has declined to endorse Beijing’s formula, she’s tried to finesse the matter, so as not to provoke more hostile and sweeping measures from China. She’s done this from the beginning of her term. In her inaugural speech, she declared her intention of governing Taiwan “in accordance with the Republic of China Constitution,” which seemed at least a tacit acknowledgment that Taiwan is a part of China. The Republic of China’s constitution, adopted three years before the Communists’ 1949 takeover of mainland China and still used on the island, considers Taiwan one of China’s provinces. “We’ve tried very hard not to give China any excuse to take hostile actions,” a Taiwanese official told me, asking to remain anonymous because of the sensitivity of the issue. But why reject a formula that worked well for Taiwan in the past? To many observers, the 1992 Consensus cleverly finessed the otherwise unbridgeable disagreement on the question of unification, which, for roughly four decades, had made for a dangerously bitter mutual hostility. Taiwan became a separately governed state in 1949, after the ruling Nationalist Party, or KMT, under its autocratic leader Chiang Kai-shek, lost the Chinese civil war to the Communists and escaped to Taiwan. But after Chiang died in 1975 and Mao Zedong died a year later, relations slowly improved to the point where the two sides could come to the understanding represented by the 1992 Consensus. That provided a formula by which relations between the two sides grew rather cordial—despite intervening dangerous episodes, like when China fired missiles near Taiwan during the 1996 Taiwan Straits Crisis. Closeness peaked during the eight-year presidency of Tsai’s predecessor, Ma Ying-jeou, when China and Taiwan signed roughly 20 deals establishing a network of relations that would have been impossible even a few years before. In November 2016, Ma and Chinese Communist Party General Secretary Xi Jinping met in Singapore, in the first encounter ever between the leaders of Taiwan and China, an event seen by many as a sign of cross-straits amity. But the explosion of ties also incited anxiety among a growing number of Taiwanese that the authoritarian behemoth across the straits was gaining too much influence and threatening to sap the island’s ability to determine its own destiny. Ma, who handily won the 2008 election, saw his approval ratings sinking below 10 percent. Giant student-led demonstrations in Taipei in 2014 dramatically expressed the anxiety many on Taiwan felt about the proliferation of mainland ties. The price of this has been Beijing’s recent moves, seemingly with the hope that the more pliable KMT returns to power in the next presidential election in 2021. In May, Beijing, making its discontent ever clearer, barred Taiwan from the World Health Assembly, the annual conference of members of the World Health Organization in Geneva that Taiwan had attended since 2009 as an observer, reminding Taiwan of Beijing’s veto power over almost all of its participation in international organizations. In June, it induced Panama to break diplomatic relations with Taiwan and establish them with the mainland, a psychological blow to Taiwan because it reduced the number of such countries to 20 and raised the prospect that more countries would follow Panama. Beijing has also increased “United Front work” on Taiwan: building closer ties with opposition KMT members, and providing free trips to the mainland to people who endorse the one-China idea, in an attempt to persuade Taiwanese of the value of restoring the more cordial relations that, in China’s view, Tsai’s stubbornness is preventing. This feeling has been intensified by two recent incidents, both of which jarred Taiwan as reminders of the stark difference between the vibrant multiparty democracy of Taiwan and the ever more authoritarian mainland. In November 2015, the teenage Taiwanese pop singer Chou Tzu-yu appeared on a South Korean variety show and playfully waved two small flags, one South Korean and one Taiwanese. Chou’s gesture ignited social media fury on the mainland, where the pop singer was accused of profiting from her performances in China while, the accusation went, repudiating the one-China principle. Two months later, facing a ban on performing in China, Chou abjectly apologized on television, tearfully repeating the mantra “there is only one China.” But the outrage on the mainland provoked a counter-outrage on Taiwan, where people viewed the pressure exerted on Chou to apologize for showing pride in her country’s flag as an act of tyrannical bullying. But no recent Chinese act greater alienated Taiwanese than the March arrest of Lee, after holding him incommunicado for 68 days. Over the last few years, Lee has both raised money for the families of human rights lawyers in China, and sent to mainland contacts books and materials on Taiwan’s own democratization. His offense, in other words, seemed at least in part to have been encouraging Chinese to see Taiwan as a model for its own political evolution. Whether he is quickly released, in part of a deal for his confession, or given a long prison sentence, his case illustrated for many on Taiwan just about everything there is to fear about reunification. Among other things, Beijing made a mockery of a 2009 agreement whereby each side will give “prompt notification” in case of arrests and will “provide facilitation for visits by family members,” which illustrated for many Taiwanese that the mainland simply can’t be trusted. The disturbances in cross-strait relations occur at a time of other difficulties for Tsai, whose approval rating has been hovering in some polls at just over 30 percent. This seems to be in part because of some of her economic policies and in part because of her handling of cross-strait relations. But while some voters, especially supporters of the opposition KMT, are unhappy with her because of her refusal to endorse the 1992 consensus, some supporters of the DPP are unhappy with her because she hasn’t been forceful enough in asserting Taiwan’s separate identity. A recent poll, for example, asked respondents how Taiwan should react to the moves China has made to isolate it internationally. 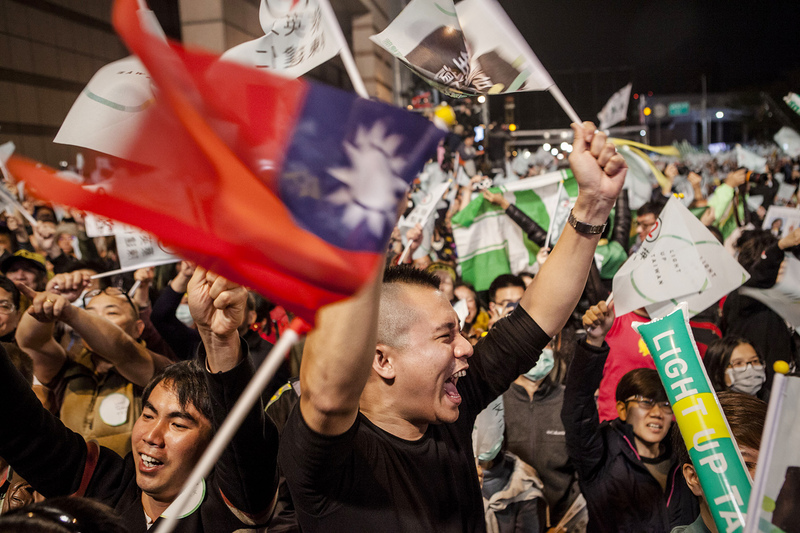 Forty percent selected the response “going our own way,” which suggested asserting a separate Taiwan identity; 33 percent selected “maintaining the status quo;” while only 18 percent favored “compromising with China.” Similarly, according to the poll, 73 percent rejected the “one country, two systems” model used by China to regain sovereignty over Hong Kong and Macau, and that it most likely envisages as a formula for Taiwan. Only 19 percent accepted it. Regardless of their preferences, Taiwanese cannot control how Beijing will handle the island in the future. There are still hundreds of daily direct flights between the two sides, thousands of students studying at each other’s universities, and roughly U.S.$180 billion in bilateral trade in 2016, according to the People’s Republic of China Ministry of Commerce. The number of tourists from China, which was over 4 million in 2015, seems projected to drop to about 2.6 million this year, but larger numbers of visitors from South Korea and Japan have helped make up the shortfall. The worry is that Beijing will get tougher, especially once it has gotten past the leadership changes expected at the 19th Communist Party Congress this October, a looming event some analysts believe is distracting China from the problem Taiwan poses. Beijing could, for example, nab more countries in South America and Africa that have relations with Taiwan; undercut Taiwan’s economy by further competing with it on the export market; pressure other countries to reduce trade with Taiwan; increase its military presence in the Taiwan Strait; ban Taiwan’s team from the Olympics; or stop the direct flights that millions of Taiwanese with business on the mainland rely on. What gives some hope is that Beijing finds itself preoccupied with other matters, the North Korean nuclear crisis most of all, but also its moves to consolidate its contested claims in the South and East China Seas. The view on Taiwan seems to be that China will not try to “liberate” the island by force, at least not in the foreseeable future. Taiwan’s best hope in this sense is that the current ambiguous status quo, neither formal independence nor reunification, persists indefinitely. What is paramount to many on Taiwan is their fierce attachment to their democratic freedoms. There is a good chance that they will endure, despite the mainland’s actions and threats. Nobody is imprisoned on Taiwan for extolling the virtues of democracy; there is no Great Firewall, by which an army of censors monitor and delete social media postings; no blocking of foreign websites, from Instagram to The New York Times; no crime called “subverting state power”; and certainly no bullying of teenage pop singers into apologizing for displaying their country’s flag. The Pulitzer Center of Crisis Reporting provided funding for this reporting.